"Our trip to Kenya and Zanzibar was the perfect way to celebrate our wedding anniversary, tick a safari off of our bucket list and discover wildlife in a way we could never have imagined. " They travelled with Exoticca in June of 2018. An amazing experience, never to be forgotten! With our wedding anniversary coming up, my husband, Mark, and I were looking to share a holiday together and we were looking for something a little out of the ordinary. 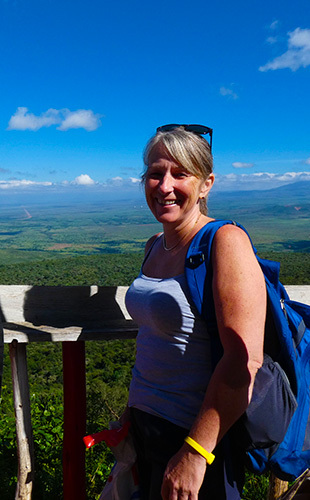 A safari in Africa was always on our Bucket List and we were both keen to enjoy a more adventurous trip, after being on many European holidays over the years with our children. 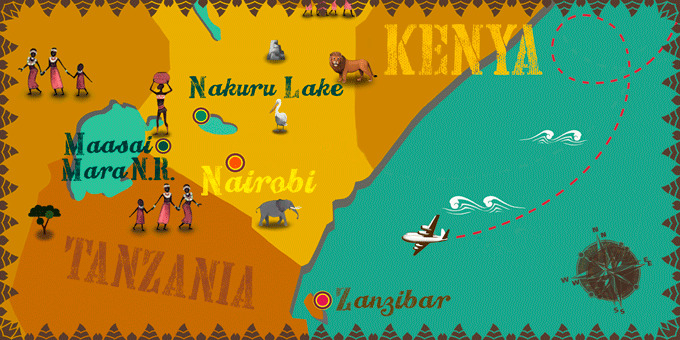 We had never been as far afield as Kenya before and after months of looking out for offers we saw Exoticca’s Kenya & Zanzibar twin-stay safari and beach holiday and thought it was a really amazing price, such good value, so after a little research we finally booked up! As it was our first ever safari experience we weren’t 100% sure what to expect. We arrived late in the evening to Nairobi and spent the night at a really accommodating and comfortable hotel, ready to set off for Lake Nakuru in the morning. The next day is when we met our guide who stayed with us for the entirety of the safari, a lovely man named Benson. He gave us valuable insight, not only into the wonderful wildlife of Kenya and its vast national parks but also into the country’s culture and he was such great company as well. Driving through some areas of Kenya, the cultural and economic differences between here and the West were very evident and it was an eye-opening experience. Despite the deprivation of some communities, the locals were always so friendly. Throughout the whole holiday, everybody we met was welcoming, which helped to make the trip a special one! On our way to the Maasai Mara National Park we passed the Great Rift Valley, part of an intra-continental ridge that runs through the country north to south, where we managed to buy a few charming African ornaments from a local seller as mementos to take home with us, as well as a trusty fridge magnet to add to our growing collection! The whole safari experience was faultless, in both the Lake Nakuru and Maasai Mara National Parks. We were accompanied in our group by another couple with grown-up children who were lovely people to share the experience with and our driver was flexible so we were able to go out on the drives at times that suited us. We were lucky enough to see such an abundance of wildlife, only the leopard and crocodile evaded us, so we have a great catalogue of animal photos to look back on! One morning, we set off on an early morning game drive, as it’s often the best time to spot the animals, we were rewarded with a sighting of four lionesses with their seven cubs. It was so beautiful to see these animals in the wild; it is an incomparable experience and every time you spot the wildlife it imprints on your memory forever! The exciting days on safari were matched by relaxing nights spent in the lodges, which offered a 5-star experience, despite being in remote locations, set in amazing natural landscapes. The lodges were well-equipped, comfortable and clean. We received such lovely service in both the Lake Nakuru and Maasai Mara lodges and the staff couldn’t do enough for you, turning down the bed at night and drawing the mosquito curtains over the bed. One night, despite being 28 degrees Celsius outside, we came back to our room to find a hot water bottle in our bed, a lovely touch which made us feel special. Although it was warm for us, this time of year is considered winter in Kenya, which explains the hot water bottle! The swimming pool at the Maasai Mara lodge was a refreshing treat as well, after a long day out on safari. We also felt quite lucky to visit Lake Nakuru, not only due to the flourishing bird and animal life it is home to such as flamingos and rhinos, but because the locals are concerned that the rising water levels, due to an abundance of rain in recent years, could mean that the area could be unrecognisable in years to come. After the full-on safari experience we were pleased to have the relaxing beach stay in Zanzibar to look forward to. The hotel was a beautiful, tranquil retreat with two idyllic pools and a private beach and it certainly lived up to our 5-star expectations. As in the other accommodation, the staff were unbelievably helpful and accommodating and they couldn’t do enough for you. We thought about going into town and exploring Zanzibar further but we were so comfortable at the hotel we were happy passing the days relaxing by the pool, eating the fantastic food and reading a few books; it was the perfect end to a bucket-list holiday. We loved the themed nights and the gala dinners that the hotel organised, including a fabulous African night on the beach which included lots of delicious drinks and traditional food. The choice of restaurants in Zanzibar was top-notch too. There was something to suit all palates including fabulous beach-side restaurants that served sushi and burgers and the All-Inclusive package was great. The cuisine throughout the trip was fantastic and extremely varied. All the hotels offered plenty of choices and the staff were always recommending different drinks and local delicacies to us. I was apprehensive about what the food in Kenya would be like, but I had nothing to worry about as everything was fresh and delicious. We loved the fresh fish and the traditional goat curry in Zanzibar and we liked how the salads were chopped and freshly dressed in front of you. We ended up trying everything, which was great because you needed the fuel for the busy days on safari! We were also pleased with the weather throughout the trip. It rained on one of the days in Zanzibar, but during the rest of the trip, it was around 28 degrees, a bearable temperature that was great for wildlife spotting and even when it was slightly overcast we enjoyed the cooling break from the hot African sun. Our trip to Kenya and Zanzibar was the perfect way to celebrate our wedding anniversary, tick a safari off of our bucket list and discover wildlife in a way we could never have imagined. 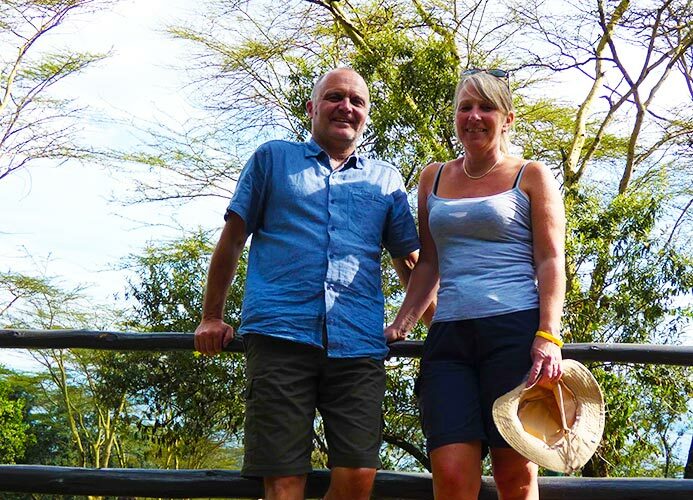 We have been recommending the trip to friends and family and we have come home with many anecdotes and fond memories of Kenya which we will keep forever. Although unsure of what to expect from Kenyan cuisine, I was pleasantly surprised. Be sure to try the fresh fish in Zanzibar… it’s delicious! Make sure you have a good camera to capture the wildlife and beautiful sunset and sunrise but be prepared as it's over very quickly! 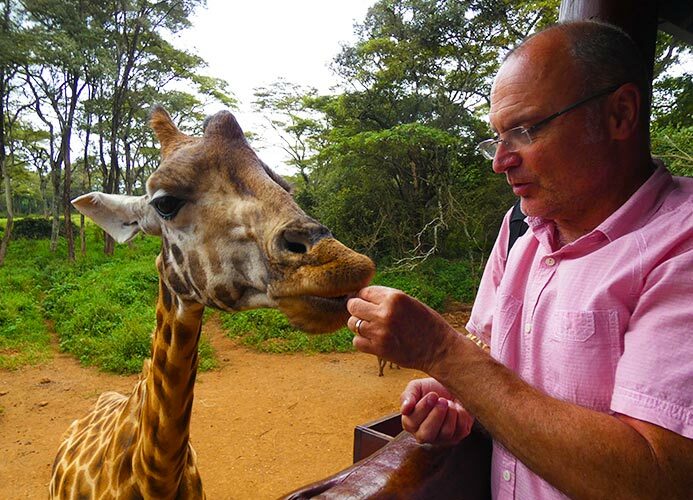 If time allows when venturing back to Nairobi, call in at the Giraffe Sanctuary. Situated in the southwest of Kenya and covers an area of 583 square miles, the Maasai Mara National Reserve is full of breathtaking vistas, abundant wildlife and endless savannahs and arid plains. The reserve is home to an excellent year-round variety of game, including the iconic zebras, wildebeest, and antelopes that make up the famous Great Migration, an unmissable experience for nature lovers!